Publisher's summary: Everything Conatus stands for is at risk. Hoping to gather enough resistance to save their order, Ember and Barrow attempt a desperate escape. But fate offers little mercy. When their mission is exposed, the couple face relentless pursuit by the supernatural horrors that act on the commands of Eira’s ally: the mysterious Bosque Mar. A shocking revelation forces Ember out of hiding, sending her back into the heart of dark magic at Tearmunn keep, where she must convince her old friend Alistair of her love or face dire consequences. Ember’s deception offers the only chance for the resistance to succeed, but what she discovers in the shadows beneath the keep will shatter her world and bring about the Witches’ War. 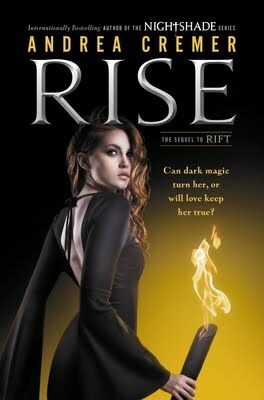 I'm disappointing with myself that I haven't read Rise yet! So I want to give someone a chance to win it! This is a QUICK giveaway because the release is Tuesday. Open International shipping and will be ordered through Amazon or Book Depository. See if I'm running any other giveaways HERE! I've only read the first book in Nightshade. And although I am not a big fan of werewolves, I think the plot is really amazing. I didn't like the characters, though. I still plan on reading the rest of the trilogy but not real soon. And I'm looking forward to read the rest of her books! I read her NIghtshade series, I loved the world but I was very disappointed with the last book. I did pick up Rift few months ago, and what can I say, Andrea Cremer writes really great stories, I just hope nothing bad happens at the end of this series. I have not read either book but i am going to look intot hem! this book sounds very, very interesting. I've read the Nightshade trilogy as well as Rift, and I absolutely LOVED them! Well, except for Bloodrose. I like this prequel trilogy better, though, so I'm really looking forward to Rise! I read the first book but I didn't get to finish it yet. I'm planning to though. I haven't read either of the series but it seems interesting so I'd love to read it ! I love the Nightshade trilogy! I love how Andrea played with the wolves' mythology and blend some magic with it. I haven't read all of the Nightshade Trilogy yet, but I'm getting there. I've read half of Nightshade already and I like the storyline about wolves. I haven't read the Nightshade series yet, but have books 1 and 2 ready to go. I have pledged to read it this year though. Thanks for the giveaway. No, I haven't read the Nightshade Trilogy or Rift, but I would like to read them. I haven't read the Nightshade series yet, but have nightshade ready to go! Yes! I've read all the Nightshade books and Rift! Cannot wait to read this one either! I have read them all.and loved them. I cant wait to read this one!! I've read the Nightshade triology and let me just say that Andrea Cremer created quite an amazing emotional ride. The story got better and better with each book! I read Nightshade and LOVED IT! I met Cremer last Spring when Rift was released. I am reading rift now. I love her writing. Not yet! That's why this giveaway is so exciting! I began the nightshade trilogy and have enjoyed it! Yay! I'm looking forward to this release. It sounds like it has great characters and action! I've read all of them, and really loved Rift! Can't wait for this book. I haven't read Nightshade yet, even though my copy is sitting pretty on my bookshelf. I'm still reading through my pile of books I bought back in 2006!! I have Nightshade and plan on reading it this month! I've read only the first two books in the nightshade trilogy. I have yet to read the last. So far, they are kinda boring. I've read the Nightshade Trilogy and Rift! I loved the Nightshade Trilogy up until the ending of Bloodrose. That just made me die a little inside. I really loved Rift though! I thought it was fantastic!! I haven't read either of them but have heard good things about Rift, especially. I've read all of Andrea Cremer's werewolf books! There all so flipping amazing! :D Can't wait for the release of Rise! No, I haven't yet, but they sound like interesting reads! No, not yet but I recently ordered it and can't wait to get started!! I've not read the trilogy or Rift yet. I hope to get to them soon, I hear they are excellent. Thanks for the giveaway, Happy 2013!! I haven't read any of them yet, but they're on my tbr list. I haven't had the pleasure of reading either yet, which is really sad considering how much I want to read them. I just get buried in review books. Which is why I signed up for the TBR Challenge. I will read my TBR books! I've not yet read the Nightshade trilogy. It sounds great! I haven't read any of Andrea Cremer's books. Hopefully, I win! I haven't read them yet but I have two of them! Thanks for the great giveaway! I haven't read the books yet, but I've been wanting to. Thanks!! I have not read the books yet, but they are on my TBR list. I love the covers and the story and I hope I'll read them in the near future. Thank you for the giveaway!